The most poignant music is often inspired by watershed events in an artist’s life, and few occasions are more transformative than the arrival of one’s first child. 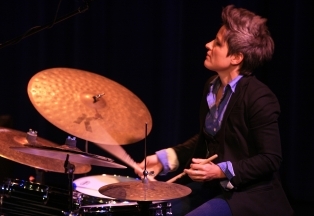 For Allison Miller, the extraordinary drummer, composer, and leader of her band Boom Tic Boom, that life-affirming experience provided the seed that led to the creation of her new full-length studio album, Otis Was a Polar Bear (The Royal Potato Family: April 8, 2016). The album, with violinist Jenny Scheinman, cornet player Kirk Knuffke, clarinetist Ben Goldberg, upright bassist Todd Sickafoose, pianist Myra Melford, and Miller on drums and mallet percussion, is Miller’s latest collection of 10 original compositions.